It’s that time of year again, when everyone’s organic gardens are booming with summer squash. 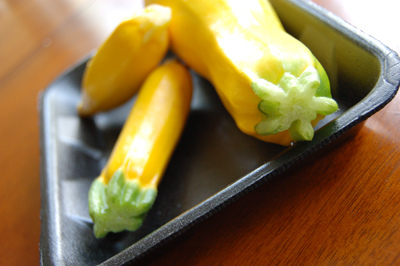 From zucchini to patty pans, I’m always looking for ways to use up a lot of summer squash in a delicious dish my kids will enjoy. Ever since I tried Kelli’s balsamic asparagus, I pretty much follow her instructions for any vegetable that is in season. Here’s my secret to success: I don’t measure anything. Cut up summer squash into large pieces (I cut a zucchinis into eighths). Pour olive oil into the bottom of a glass pan. Add the summer squash, then drizzle with more olive oil and balsamic vinegar (look for low or lead-free vinegar). Salt and pepper to taste. I told you, it’s super simple. My kids love it, and we can easily eat up four to six zucchinis this way. Sorry compost pile, we’ll be eating all the summer squash this year. Image: jspatchwork on flickr under a Creative Commons License. Wow – super easy and it sounds great! G20: Should Children be Involved in Climate Protests?